Monks in Thailand are well known to receive donations from Thai's and Tourists. Most people will happily give a small donation, and sometimes they won't give anything. Which is their right. Yesterday (29th December 2015) in Chang Mai, Thailand a monk was a bit unhappy that a member of the public wouldn't give him a donation. So he gave the middle finger. 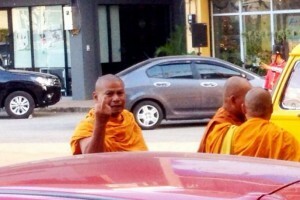 Apparently the group of monks he was with were hanging out at a shopping mall in Chang Mai. Not very spiritual of him really. 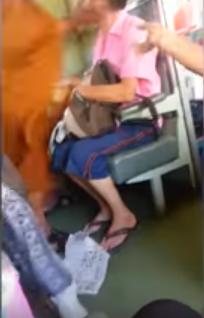 In December 2014 another monk was recorded slapping a farang tourist around the face, on a train. You can watch the footage here. Apparently the foreigner was sitting opposite the monk. Then 2 girls came over to sit down so the foreigner got up and asked the monk if he could sit next to him. The monk in a not so quaint manner said he couldn't understand and didn't move. The man spoke in English said 'fine'. The monk thought the foreigner had called him 'Kwai' which means Buffalo in Thai. So the monk slapped him.